When an unstoppable force descends upon Magnolia and Fairy Tail, the entire town is transported to Edolas, a world where magic is in short supply. There, a power-hungry kingdom plans on draining every last drop of magic from the captured guild - unless someone can stop them fast. 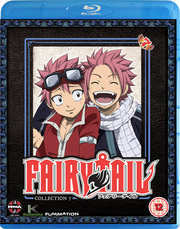 As Natsu and the few left behind search for their friends, they discover a parallel plane where a tough-as-nails Lucy runs a bizarro version of Fairy Tail, and Erza is a ruthless enemy who hunts down rogue wizards. Meanwhile, Carla and Happy stumble upon a cat-filled land where their shocking origins are revealed and a terrible betrayal comes to light. Will Natsu's team be able to save the guild when they can’t even trust each other?